Tuesday, 30 Dec 2014. Palm oil futures gap up about 1.8% on opening bell yesterday, it was the biggest gap for the past four months. This rally does caught some trader off guard when they are still using sideways /ranging technique to trade last week. Other news to follow. "- The S&P 500 edged up to another record close on Monday, but the Dow industrials snapped a seven-session winning streak. Utilities, the best-performing S&P sector this year, showed the biggest gain among the 10 main sectors on Monday. The S&P 500 SPX, +0.09% rose by 1.80 points, or 0.1%, to close at 2,090.57, leaving the benchmark up 13.1% for 2014, with two trading sessions left in the year. Monday’s mark also was the index’s 53rd record close of the year, or an average of one a week. The Dow Jones Industrial Average DJIA, -0.09% dipped 15.48 points, or 0.1%, to end at 18,038.23. The blue-chip gauge, up 8.8% so far in 2014, pulled back from a record close achieved Friday. The tech-laden Nasdaq Composite COMP, +0.00% inched up by 0.05 point to finish at 4,806.91, while the small-cap Russell 2000 RUT, +0.32% tacked on 3.90 points, or 0.3%, to 1,219.11." "- Hong Kong stocks jumped Monday morning, playing catch-up with the Shanghai markets after returning from a four-day weekend. The Hang Seng Index HSI, +0.34% gained 1.9% after recent reports said China's central bank had changed its rules to allow deposits from non-bank financial institutions to count as reserves, a measure aimed at increasing lending and boosting growth. The Hang Seng China Enterprises, tracking mainland-China-based companies, advanced 4.1%." "- Gold prices pulled back Monday after some wide swings during Christmas week. Gold for February delivery GCG5, +0.33% fell $13.40, or 1.1%, to settle at $1,181.90 an ounce on the New York Mercantile Exchange. Silver for March deliverySIH5, +0.55% also fell, slipping nearly 37 cents, or 2.3%, to settle at $15.78 an ounce." 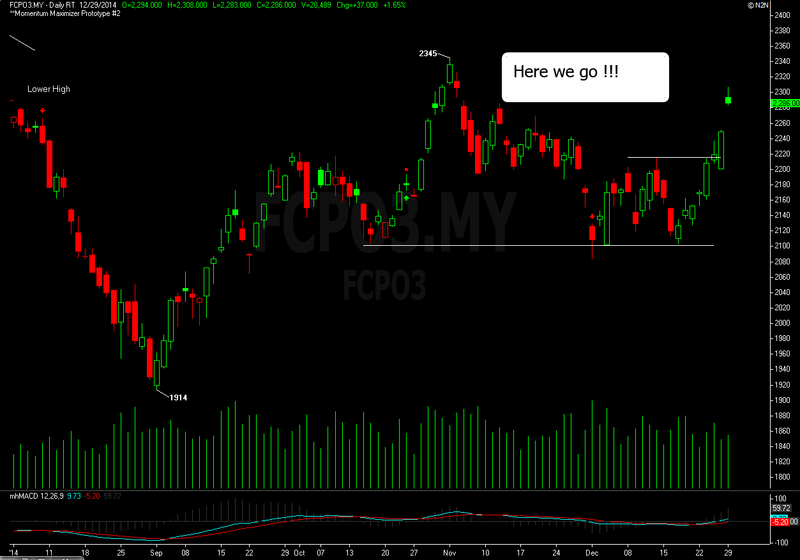 FCPO- Bulls Are Leaping Ahead. Palm oil futures is likely running on positive note after the flood condition on southern Malaysia and east coast are likely to prolong. Current weather condition is likely disturb production and logistic system for the moment. Price is likely supported by the reduced production for final month of 2014 but we are still yet sure whether this rally could turn to be an uptrend. If we are going to expect some steady recovery for palm oil, crude oil and Soy oil have to provide support as well in the longer run. Back to the palm oil technical outlook, we might be looking at continuous rally after the promising break out from two weeks resistance for benchmark March contract, yesterday. There is no telling when will the gap from 2,252 to 2,285 could be fill but if the march contract does open lower or drop lower than 2,284 level, we are likely to see some mild retracement from that level. These gap area will become resilient for the price to adjust up and down, but I am expecting the benchmark March to find support at around 2,250 level this week. Else, if the benchmark March continue to rally from here, there is no telling where is the next resistance will be and yes we might be expecting at least another 100 points rally. For today, pivot support for the March contract is located around 2,276 while resistance is pegged at 2,317.